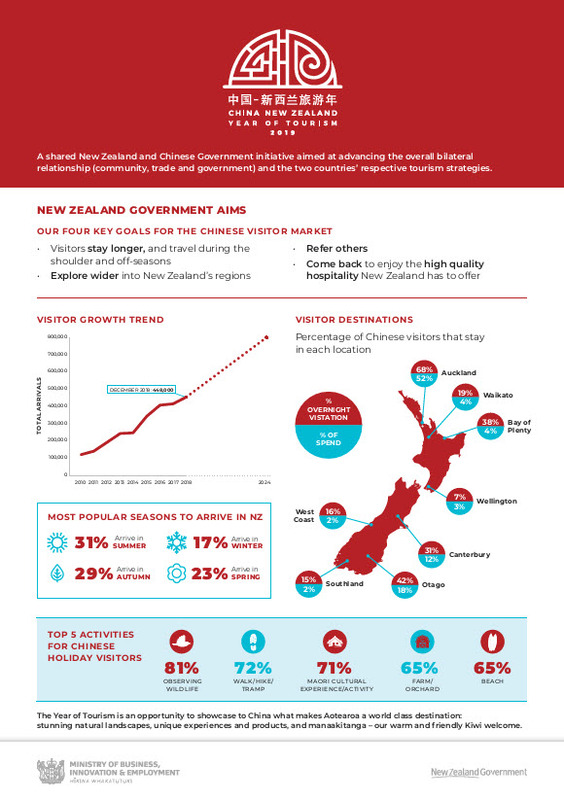 2019 is the China-New Zealand Year of Tourism and is an opportunity for China and New Zealand to strengthen economic ties through tourism. The New Zealand Ministy of Business, Innovation & Employment have developed the CNZYOT website and resources. If your business is interested in the Chinese visitor market, then you can learn more about the Year of Tourism in a snapshot. Check out the latest information on Chinese visitor numbers, when they're coming, where they are travelling too and what they're doing while they're here. There are more great resources to help you to learn more about this important visitor market on the resources page. Learn more about how to provide visitors the best experiences possible, how to make the most out of digital media and the basics of Mandarin. Are we missing something that would help your business? Email us at cnzyot@mbie.govt.nz with your idea.